For NYU Tandon’s Makerspace, the buzzing of energy and excitement is nothing new. True to its name, engineers and entrepreneurs regularly use the prototyping equipment available to them at the space to, well, make things. This time, however, the Makerspace buzzed for a different reason. Posture Sensing is developing this data collection device to insert into headphones. A few months ago the Entrepreneurial Institute and the Greenhouse @ Tandon MakerSpace announced 15 awardees for the Fall 2017 Prototyping Fund. Each team was awarded up to $500 to build their prototypes and bring their ideas to life. Two months later, on Dec 6, each team was ready to showcase their models. 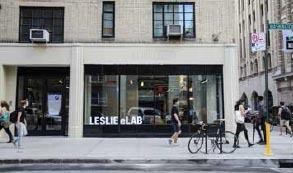 Paula Seligson, an NYU Journalism student, captured the energy of the day in this great video! Around the room, co-founders polished their pitches and answered questions about their prototype. Emily Huang (Tandon ‘18) from Posture Sensing hoped that their prototype will become a viable device to help improve posture. 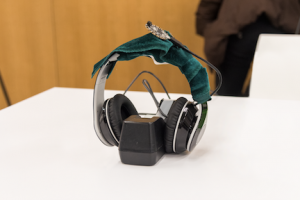 So far the prototype circuit board is only able to collect data, but the team will continue to develop it so it can eventually slip easily into a pair of headphones. 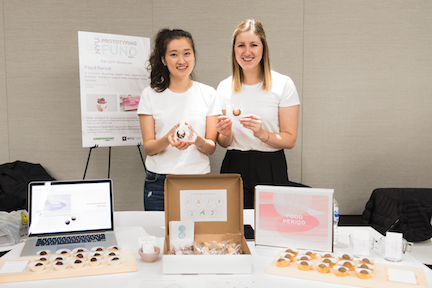 A few tables down, Britt Martin (CAS ‘18) and Jenn Kim talked about their new startup, Food Period. With their Prototyping Fund grant, they created a sample box of energy snacks they hope to sell to women who want to support their menstrual cycles naturally. They offered samples of their first product—Moon Bites—featuring all natural ingredients like flax seeds, dates, and coconut. Moon Bites are designed to sync and support the various stages of a woman’s period. 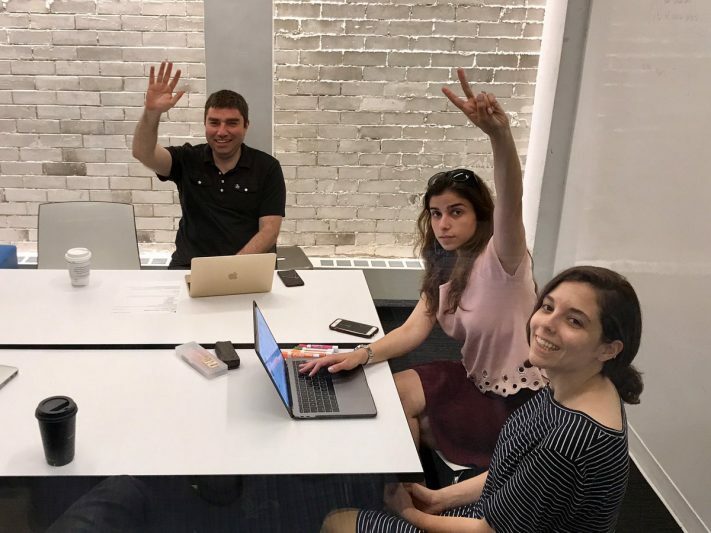 Food Period will be taking an exciting next step as a participant in the new J-Term Startup Sprint program this January to further hone their business potential. Britt Martin and Jenn Kim offering samples of Food Period's "moon bites." 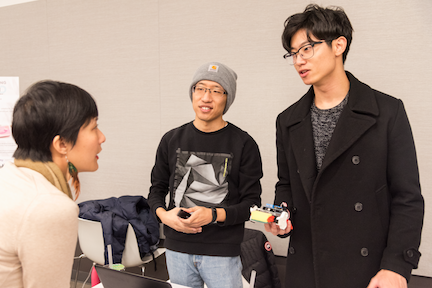 Solving a totally different problem, Mingzhe Ye (Tandon ‘19) and Yi Wei (Tandon ‘19) from Geckobot demonstrated how their cleaning robot will work. Designed for single-family homes or apartments, Geckobot can help clean one of the home’s most challenging surfaces—the exterior of windows. Armed with sticky, rolling wheels (i.e. the feet) and a replaceable sponge for scrubbing, the founders think this family-friendly cleaning device can sell in the marketplace for around $25-$30. Co-founders of Geckobot talk about their innovative window cleaning device. To visual artists, the team at Drispen demonstrated how their new pen can help solve an all-too-common problem. The smart, digital pen is designed to transfer any designs done on paper into a cloud-based digital platform in real time. The co-founders Lindsey Kim (Tandon ‘19) and Ruby Pittman (Tandon ‘20) shared that most potential customers they talked to didn’t mind the extra weight and size of the pen, but appreciated that the pen can work on any paper surface (existing competitive products require special paper for transfer to work). 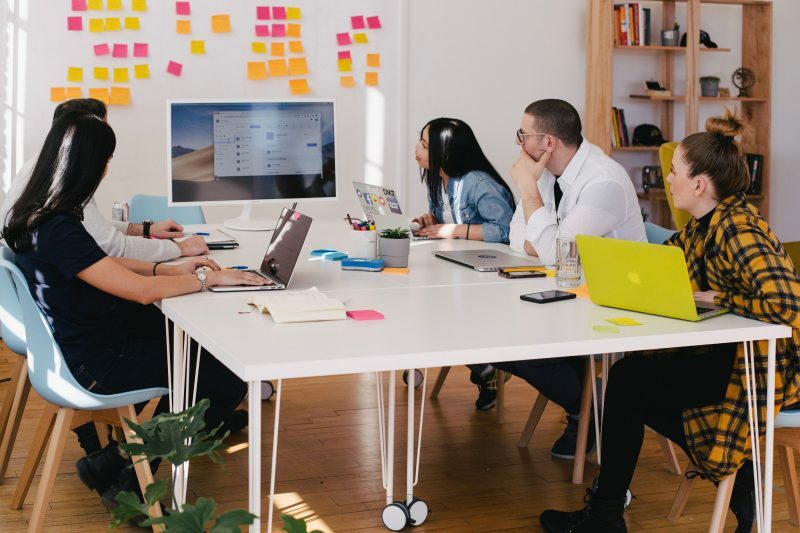 Every team that participated in Phase 1 of the Prototyping Fund is eligible to apply for Phase 2 funding, where they could be awarded up to $2,000 in grants. 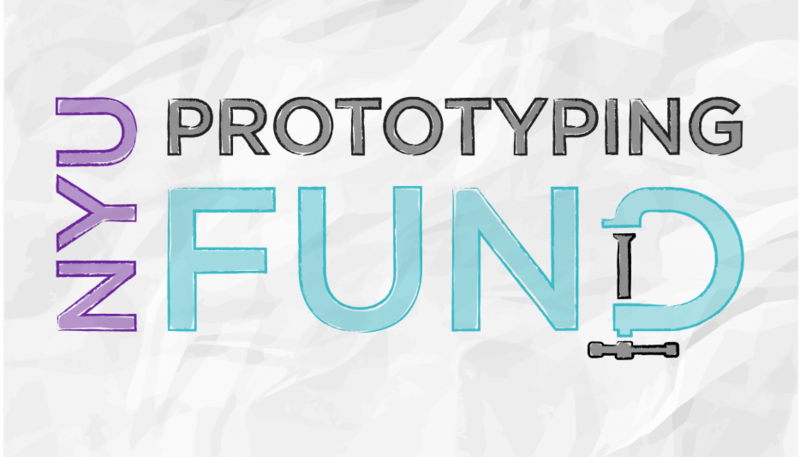 For teams interested in participating in the next Phase 1 of the Prototyping Fund, be on the lookout for applications, which will open the first week of spring semester 2018. We can’t wait to see what these teams will come up with next!